If you have healthy teeth but you’re unhappy with your smile, porcelain veneers from your Stow, OH dentist may be the right solution. Porcelain veneers are thin porcelain facings that are bonded to the front of the tooth. 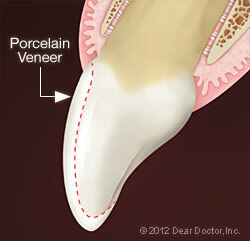 Porcelain veneers hide imperfections like gaps between teeth, large fractures and severe stains. 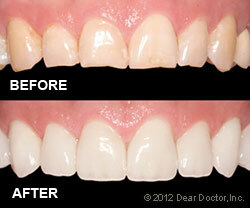 Veneer can be applied on one tooth or several teeth at the same time, completely transforming your smile’s appearance. Dr. Murphy uses the highest-quality porcelain to create veneers that look healthy and natural. Dental veneer application can take two or more visits to the dentist. After Dr. Murphy checks your teeth (may require photos and X-rays), he will determine if veneers are the best solution. The tooth is then prepared by shaping the enamel to make room for the veneer. This step is important and creates the most natural look. After buffing the surface, your dentist will take a mold of the tooth. You and your dentist will then decide on the color of the veneer. On your next visit, your dentist will clean the tooth and apply bonding cement to the surface. Next, the veneer is attached and exposed to a special light that hardens the bond. Finally, the veneer is buffed and polished. The whole procedure is painless and performed under little or no anesthetic. Find out if you are a candidate for porcelain veneers. Call 330-694-5005 now or click here to make an appointment at Aesthetic Image Dental.